The previous article about getting a guy’s attention may have helped you, but you’re still sweating over things like how you look. 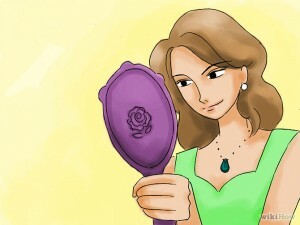 Body image is a serious issue in teen years, but mostly it’s just in our heads. Going through all the changes can mess with your confidence and how you perceive yourself, so do not forget most of your ‘ugly’ features are in your own mind. When we meet someone, we can’t help, but judge them on how they look. This first impression is strong, but can be broken. So when a boy sees you, your looks will definitely make an impact on him. But looks are not just how big are your eyes, how tall you are or if you’re too skinny, there is something that can make two people who look exactly the same appear absolutely different. That little something is called attitude and yes, it definitely can be seen on your face. For example, if you’re constantly smiling, if you believe in yourself, if you’re confident, you will definitely appear more appealing. What we’re trying to say here is that looks matter to boys, but not in a physical way, but in a how-you-present-yourself kind of way. If you appear confident, happy and comfortable with who you are, then those good thoughts will show on your face and make you beautiful. So don’t try to cover the things you like with a lot of clothes or makeup, but point out all the things you love about yourself. When others notice the things we like in us, it makes us feel more confident and that is a very important quality. Don’t forget – you may be self-conscious about how you look, but you’re not alone – boys are often as self-conscious about body image as girls. These days not only perfect girls are shown in magazines and TV, but perfect guys too. So this affects all teens’ perception about their looks. Boys know they will also be judged on looks and sense of humor, how smart they are, how strong they are, etc. So maybe they have even more to live up to – don’t make it harder on yourself or on them. People are beautiful, because of who they are, not because of how they look. In the long run you will see that an attractive person, who acts awfully becomes less good-looking by the minute. So don’t think too much about what nature gave you. Another thing that needs to be mentioned when talking about looks is being clean and healthy. Do it for yourself and it will make people notice it, especially guys. Treat your body nicely and it will repay you. It’s something you needn’t forget. For your body, being healthy and clean is the best you can do, so start right away. To sum up, looks matter but not really in the way you think. And it goes both ways so just laugh it off – who’s perfect anyway? Be confident and kind to yourself – guys will come and go when you’re young, but you’re stuck with yourself forever. So be nice to who you are.